We try to spotlight fatherhood programs we find in the news. This group is doing great work at the Newport News City Jail in a partnership between the Newport News Department of Human Services and the Newport News Sheriff's Office. Hopefully, reading it will not only show you an example of what can happen when fathers learn how to be better dads, but it will remind you that your work matters. For this who don't currently serve fathers, perhaps you will be inspired to volunteer and help fathers in your city. We talk about the father absence crisis in America and the challenge of Fathers Behind Bars, but for seven men in the Newport News City Jail, Father's Day came early this year. Read the following news story in full here. Writing about the seven men in the Newport News City Jail who are learning how to be better dads using our InsideOut Dad® curriculum, the new story points out: They believe they’ll be better fathers because of a class offered to them behind bars. They learned parenting skills and the importance of ‘being there’ for their children in the InsideOut Dad® fatherhood program, a staple of Sheriff Gabe Morgan’s re-entry program since 2013. The program is a partnership between the Newport News Department of Human Services and the Newport News Sheriff’s Office. Caring for self, parenting skills, fathering skills and relationship skills are the five characteristics of an InsideOut Dad®. Shawn O’Keefe, Youth Programs Specialist with the City of Newport News, teaches the course. He is a single father with primary physical custody of his two children so he wants to help other fathers be the best parents they can be. O’Keefe was trained to become a certified instructor by National Fatherhood Initiative, creator of the InsideOut Dad® program. “Since this is a voluntary program, the men who go through it are motivated to be successful fathers,” O’Keefe explains. So far, 107 inmates in the Newport News City Jail have completed the program. 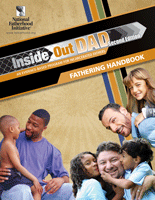 As we point out due to InsideOut Dad® being evidenc-based, the curriculum helps reduce the number of men returning to jail by reconnecting incarcerated fathers to their families, providing the motivation to get out and stay out. Do you currently or have you ever worked with incarcerated fathers?